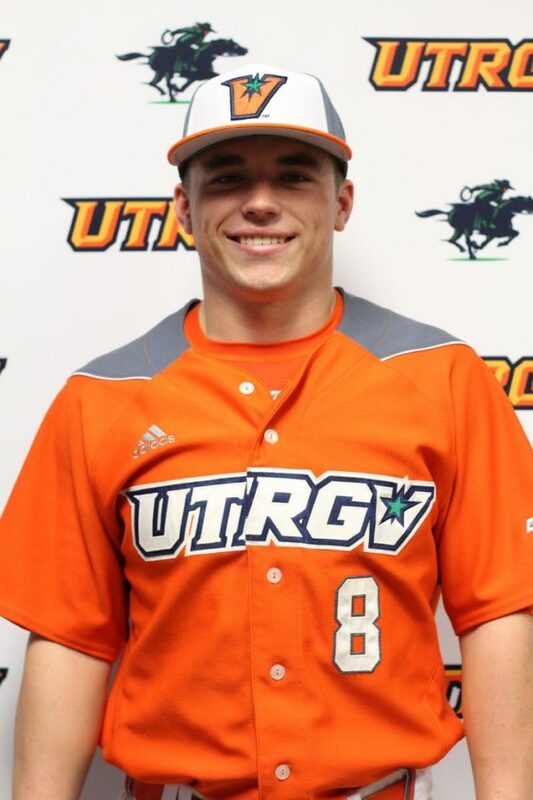 EDINBURG — As a strong defender and the fastest player on UTRGV’s roster, center fielder Connor McMahon wasn’t surprised to take a place in the Vaqueros’ starting lineup from opening day. After spending last season at Kansas City’s Maple Woods Community College, McMahon, a sophomore, slotted into the No. 9 spot in UTRGV’s order, where his bat would be less important than his other tools. Through his first 15 games, McMahon was hitting .225. Then, something started to click. During UTRGV’s first WAC weekend, facing Utah Valley on March 26, McMahon did just that, stepping into the leadoff role. He ended that day hitting .301 and still maintains a .305 batting average with 20 RBIs, 32 runs and nine stolen bases to rank was one of UTRGV’s most productive players as the season enters its final stretch. McMahon has been batting leadoff in UTRGV’s last 21 games and has notched hits in 12 straight — the longest hitting streak on the team this year. He’ll next have the chance to continue that stretch Friday against Northern Colorado, when UTRGV ends a run of nine days off following a 13-3 win against Texas A&M-Corpus Christi on Tuesday. McMahon credited his success at the plate largely to a few mechanical adjustments he started making during the fall. Mantrana wanted to change the “load position” of McMahon’s hands on his swing, hoping to create more ground balls and line drives that would allow McMahon to use his speed. McMahon has noticed a difference in the speed of the game and the quality of pitching he faces since moving up to the Division I level. His offense has been limited to mostly singles. Of his 51 hits, McMahon has just four doubles, one triple and no home runs. Seeing the improvement McMahon has made already, Mantrana said he believes the sophomore has the potential to be “pretty darn good” during his junior and senior years. McMahon has just one error in 106 chances in center field, and he is one of only two players on the roster who has the green light from Mantrana to steal bases any time he wants.